What will he decide? What will the cost be? The report of the Tax Working Group heralds potentially one of the most significant shake-ups of our tax system in the last thirty years, whatever one may think of its individual recommendations. Yet it was surprising and disappointing that with the report's likely conclusions having been canvassed openly in the media for some time before their release, and the prejudices of some of the group so well known in public for so long, that the responses of the political parties were universally trite and banal. The Labour Party had commissioned the Tax Working Group, headed by its own former Deputy Leader and Minister of Finance, to get it off the hook the Prime Minister's "captain's call" during the last election campaign that in its first term Labour would introduce a comprehensive capital gains tax if it came to office had so very nearly impaled it upon. Yet, when the report was released recommending such a tax, the Prime Minister and the current Minister of Finance could not move into full back-pedal mode quickly enough. The Prime Minister's opening effort was simply pathetic - that most people would not be affected, and the government had made no decision to proceed. If that was the case, what was the point of having the inquiry in the first place, especially given the almost moral laxative tone to Labour's previous language that such a tax was absolutely vital to curb the evil of property speculation so rife in the average population and which was at the heart of the housing crisis? But National's response was no better. One would have expected, after so many months to get ready, a far more damning and piercing critique of capital gains taxes, and their complexity and uneven incidence, than the foolishly overly dramatic line that the report was an attack on the "Kiwi way of life". To make matters worse, National's spokesperson was quickly identified as owning a number of non-residential properties, (of itself not an issue of great importance) but one which immediately stoked the latent fires of envy and claims of self-interest. Moreover, it is not 100% clear from these comments that National will commit to repealing every extension of capital gains tax rules that Labour may introduce. They have said they would repeal the Working Group's recommendations if they were implemented, but their position appears a little more ambiguous than it should be on the question of their approach to a very watered down response from Labour. While they will undoubtedly oppose that as it goes through the House, it is not altogether clear as yet if they would actually repeal it when next in government. National should be unequivocal and commit to repealing any form of capital gains tax, however wide or narrow, introduced by Labour, within its first 100 days of taking office. That is a much clearer position for the public to understand and evaluate than waffly statements about the "Kiwi way of life." Greens' co-leader James Shaw used to appeal as a sensible and reasonable man. However, his comments on the issue of capital gains tax will cause a reassessment of that assumption. First of all, a few weeks ago, there was his extraordinary pronouncement that the government of which he is part would not deserve re-election if it did not introduce a capital gains tax. All that did was remind people that the wacky, watermelon Greens were back, and possibly drive a few more voters in the direction of the new blue-green party being touted. Equally bizarre was his comment this week that the government was elected to tidy up the tax system. Without wishing to appear picky, the government was not "elected" to do anything - no government ever is under MMP. Like its predecessors, this government was concocted after the post election government formation talks. And the very nature of government formation means that the specific mandate claim becomes even harder to sustain. Again, like its predecessors, this government was formed to implement the policy agreements contained in the coalition and confidence and supply agreements of its composite parties. That is, after all, how multi-party government works. All of which leaves New Zealand First. Loud in opposition to capital gains taxes in any form before the election, the party has been unusually, although not surprisingly, pretty quiet since the report's release. The way the numbers fall, New Zealand First knows that whatever it decides, the government will have to adopt. It also knows its support base would most likely oppose extending capital gains taxes, and that this could be the very issue to differentiate themselves, and possibly split from, Labour over, to boost its chances of surviving the next election. But it also knows the considerable risks in doing so, and, more importantly, that time is on its side. It does have to do anything until it is sure and ready. And what it decides will become the government's response. No wonder its Cheshire cat smile is broadening. So, after the lengthy process of the Tax Working Group, the publication of its recommendations, and the less than stellar initial responses from the major political parties, whether or not, and when, New Zealand gets a capital gains tax will ultimately be decided, not through due Cabinet process, or full debate within the caucuses of the respective governing parties, but simply and solely through the Byzantine and labyrinthine processes New Zealand First's leader follows to make up his party's mind. Such is the process of democratic government in New Zealand in 2019. He has a point - the politics have been poor. Too much for me and 99.999% of voters to read so we depend on our pollies. Suspect plenty of trouble obscured by discussion of CGT on investment property which judging by current market and international experience will bring in very little tax for many years. I'd vote for whoever is willing to commit to abolishing any new tax where the compliance costs for taxpayer and collection costs for IRD are more than a fixed percentage of the money raised (say 20%). Why have a tax working group and prejudge their findings by removing the possiblity of including CGT or windfall tax on the family home before they start? I think so too. And also I for one have not forgotten his stand against the Clark/Cullen government who hiked up income tax over the top of the GST introduced by the previous Labour government. You cannot discount a repeat of this if a CGT does eventuate. In other words you end up down the track with the new tax, CGT, and income tax at the same old previous level(s.) Bracket creep of course does a good part of that anyway. And sadly what is going to have the most significant influence as far as Winston is concerned is not about the fairness and equity regarding CGT but rather appeasing the rural farming community (with farmers disadvantaged more so by a CGT) which is where NZF is endeavouring to gain political support as is seen in his regional development fund (which is of questionable benefit other than political popularity). That argument would apply whomever he'd agreed to form a government with. However, at least government's now present more than 50% of voters, rather than the much lower proportion that was often represented under FPP. Of course there are things we should fix: lower threshold, a form of single transferable vote etc. The kind of things and electoral commission would recommend and politicians would ignore. All parties have pre fixed opinion so can never have sensible discussion. Also many poltical leaders and other powerfull / influential people own two or number of properties (vested Interest) so as soon as you mention the word CG - they loose their cool and will go out to defent the tax free income that they have been use to and fairly so. No, Peter, that's an entirely honest and principled perspective, and one consistent with being its goal of being a transformative government. ...or a continuation of the naive approach of just positioning themselves as a Labour 2.0 for people who feel Labour isn't loud enough, shouty enough or for whom the Labour brand doesn't play well enough in well-off urban circles, and handing all the actual power in what happens in the country to NZ First. As we have seen from the Greens, however, they really don't place a high value on achieving meaningful outcomes and would prefer to saber-rattle away from afar. Maybe we should just wait and see what they actually propose to take to the voters in the next Election. History is littered with examples how well that works, not. How the heck can the politicans gauge the mood of the voting public if they wait like stunned mullets for something concrete to react to. It would be ridiculous to wait until they have made their decision on the shape of the CG tax before commenting, by then it would be too late for input. Its probable robertson and ardern have already decided they just haven't told us. That is the most damning criticism of Peters I have ever heard. And strange considering that every time those two were in parliament together, the love between them was so palpable, you always felt like shouting, "You two, get a room!". To his credit Mr Dunne tried to actually get one aspect of 'fairness' in the tax system by getting a bill on income splitting (where currently single income earners are unfairly treated) to first hearing only to be turned down by the Govt. I don't think the TWG has looked at income splitting? Nawww...peters is not omnipotent as he couldn't form the coalition by himself. The cgt has to be put in place somehow, preferably with farmers as part of it, its not fair otherwise. Farming has been given special privilage in areas like H&S, water, emissions yet it simply breeds complacency and contempt and creates huge costs that are picked up by other taxpayers. If I'm going to pay cgt on my sharetrading portfolio everyone else should be paying on their various activities too. ... any reasonable taxes that Cullen recommended ( tax on pollution of air and of water ) , got swamped by the hysteria over his ridiculously onerous CGT proposal .. Naive comments for a long-time polly. 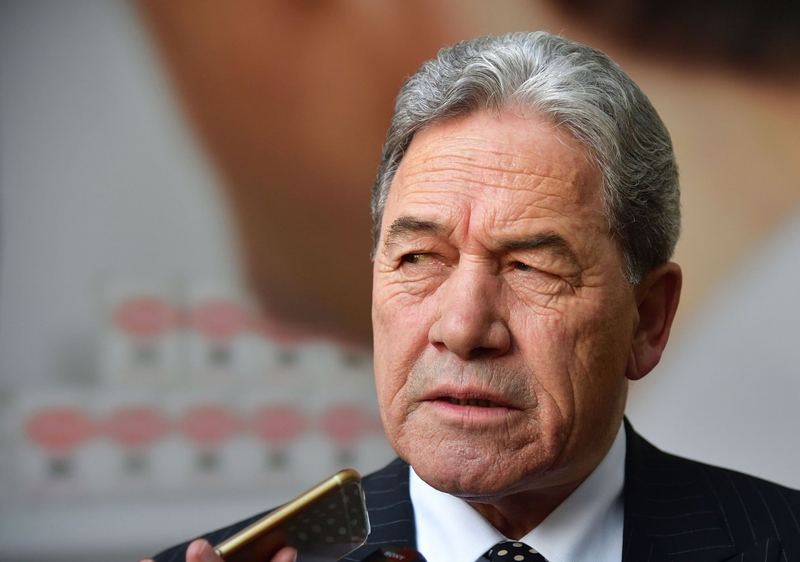 National would love the heat to come three months out from the next election, as would Peters. No point in winning victories that will have been forgotten about in 18 months' time. Labour, though, will be best served by backing down and simply pinging multi homeowners, of which there are quite a few in their ranks. That's what's this always about, effectively the politics of envy regarding speculators who made tax-free megabucks out of Auckland house prices driven into the stratosphere by Chinese buyers. Dunne criticizes the major parties for not have a more impassioned decisive response but then criticizes James Shaw for having an impassioned decisive response that was simply aligned with what the greens have always believed. How does that make him "wacky"?. Also the tax would have to be agreed upon by the three parties that the New Zealand public voted for to the extent that they could form a government under MMP a voting system that the New Zealand public voted for twice. How does this demean democracy?. New Zealand First and United Future we born out of MMP. I feel that Peter Dunne is just jealous that he could not attain the influence that Winston has now. Dunne was just a governmental poodle created by the system he criticizes now. Never liked the man, or his bowties. Most other countries in the OECD getting along fine with a capital gains tax, despite the hysterical reaction of some in NZ. "It's there as a key equity balancing tool that balances out between those that are engaging in active income generation through labour as opposed to more passive investment returns through capital gains tax." Apparently there are three OECD countries incl nz that do not see the need for a cgt. If that is just OECD then how many countries worldwide without a CGT at present so nz is far from being alone? Will the CGT really achieve the amazing and magical results that non-property owning nzers are wanting, like bringing down property prices or will it have the opposite effect on rents? The CGT will hurt the young, far far more than those who already have investment property so instead of helping the young save for retirement they will be handing their hard won retirement savings to the Government, how fair is that? The one amazing magical result would be a more fair and equitable approach to taxing earned and unearned income, rather than foisting all the burden on those who earn by working and none on those who earn by speculating. right , so the driver for CGT is ideology - nothing else . Good to hear it from the horses mouth. Sometimes whats popular is NOT whats best for a country. It's a shame none of our politicians seem to have the backbone to do whats fair and just for the average kiwi, despite it staring them in the face many times. They are all worried about their next election vote. Who's looking after the long term big picture? No one - that's why NZ is a such a big flipping mess. You know the Germans have capital gains tax on real estate, but only for houses owned less than 10 years. It's brilliant when you think about it. It disincentives flipping, but it's not so onerous that you cant get around it. You could even implement that one retrospectively which would circumvent the cottage industry of providing overvaluation appraisals which would spring up in 2021 under the current CGT proposal. Keeps a sense of community. Get a better paid job in Auckland an you move your kids to a better school zone. Not in Germany. Also their renters tend to have long tenancies. I don't understand your comment. Are you saying that New Zealand and Germany are so different in terms of school zoning and regional pay disparity that the respective tax systems are not comparable? It is a general comment that applies to most countries - people like to live near to people like themselves. Thus immigrants tend to clump together (OK not Indian owned Dairies) and you get middle class suburbs and very wealthy suburbs. It applied to London with the East end being the poor area for hundreds of years. In NZ retirement villages are upper middle class Kiwis choosing to live together. Generally it is not a good thing - you end up with children in communities and schools with minimal good role models and low asperations and therefore lower social mobility and greater class conflict.. So what works to keep the diverse vibrant communities beloved by our academics (you can find them huddled in university ivory towers and pleasant houses in upper middle class suburbs) - firstly no problem in small towns and secondly any obstacle that prevents the wealthier moving to wealthier property. France has very high stamp duty (my ex-wife paid almost 20% of the house price) and Germany has a tradition of upgrading their property rather than moving - I'm assuming their CGT applies to their home and maybe I'm wrong. Yes I agree birds of a feather, it's inevitable. With regard to the German CGT, it applies to investment properties (so I was told by a friend who owns a few over here). After ten years you're golden, zero capital gains tax. basically a ten year bright line test. Realistically in order to get the CGT over the line in NZ, the tax has to somehow be avoidable. The 5 year brightline test is long enough. When it was extended by labour, stuart nash argued that 5 years is the threshold between investors and speculators. Thanks for the info and for corecting me. I agree about Germany. Teachers in Germany have a very high status - it s not unusual for a tertiary academic to move to being a teacher - imagine that in NZ. "the tax has to somehow be avoidable" - in the UK you move your family into the property for 12 months and then sell. The central europeans value education and educators ahead of farmers and rugbyplayers, that alone means their population has more options than ours. We simply do not structure mobility into our society in NZ, thats why so many leave to go overseas and why our arrival lounges are full of inbounds from countries that have captive lower classes...they're used to it but we have better internet. Let's face it, CGT is about the politics of envy and greed. Michael Cullen is famous for referring to group of people once as "rich pricks", while for most NZ'rs he is one of them. Certainly the attitude he demonstrated in office, and on occasion since, seems to place emphasis on the second word. The most recent methods used to measure economic performance seems to fixate on perceived value in some areas. A change in value here is essentially meaningless. For example, if I purchased a home twenty years ago for $100 k and the market now seems to suggest that it should be worth around $800 k, MC says I should be taxed on that change of value. But that value is only a perceived change and does not become real until I sell the property or borrow against it. Indeed owning a property is a liability. There are ample examples to demonstrate that ownership of property has driven people into bankruptcy. The change in the tax system should be used to tax actual income, not perceived income, or that dreamed up by a devious accountant. Bang on CGT is about politics of envy and greed. Politics of extreme so a balace is need of the day. Cannot be implimented as suggested by the commitee nor can be ignored totally. Labour will have to do a balancing act for if it ignores will lose as most of it supporters support CGT and if it goes all out than also will lose so most probably will go with CGT on investment house as a compromise and can also argue that it already exist in the form of bright line test so why the fuss. So you are perfectly ok with profits being un-taxed? or is that the greed bit? Envy? no, when I pay my PAYE, or tax on my deposits and yet someone with multiple properties does not that is un-fair, its not envy in the slightest. Steven, if a person owns multiple properties, any change in value is meaningless unless they realise that change somehow. This could be through borrowing against it, or selling it. A property investor who rents out a property will be realising an income from that property, which will effectively make them a business owner irrespective of how many properties they own, with all the responsibilities and accountabilities that come with it. A change in captial value doesn't have any real value until that property is converted to dollars, and only then can be called a profit or loss. A down side is when a person who buys a property for the capital gain but does not rent it out is a land banker, and that has a negative impact on society that needs to stopped. In the same way that tax on earned income is about the politics of envy and greed. No difference. In the same way Lottery winnings aren't taxed in New Zealand, Capital Gains are not taxed either. Indeed, some countries are even more uniform in their taxation of different types of unearned income. Scant relevance to the point in hand, but very nice all the same. Good comparison nzdan, I think both are a windfall gain. When you look at the economic landscape at the time of investment, the investment feels risky most times. Others look at any subsequent gain and either want to take it from you or say you dont deserve it. Hell they have no idea the struggle to make the investment work. a) No one (except maybe extremists) is saying take all the gain from you or that you dont deserve it I certainly do not. Just the gain should be taxed like any other gain should be. Now should it attract 30%? Given how hard it is to work out / dodge gain probably some % less say 15% blanket tax with no ability to claim on a loss. b) Building a real business usually involves considerable risk, hard work and long hours. Buying a house and renting it out is pretty much very low risk, very low loan cost, low time and doesnt take work for the asset to appreciate. Indeed, telling that arguments resort to misrepresenting the nature of such a tax. I assume the $20 ticket has GST on it so some tax is paid on purchase. In effect its a 15% tax "hidden" in the ticket price. Now if you had to pay 15% "stamp duty" on a house well same thing but a heftier charge. Property might have been low risk Steven. But that was then and this is now. The wind has changed.